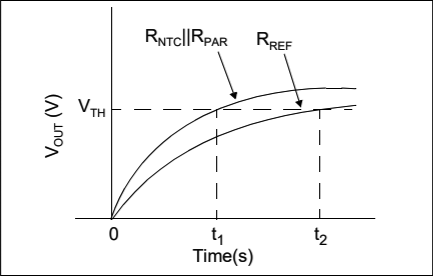 AN685 figure 8: The RC rise-time response of the circuit allows microcontroller timers to be used to determine the relative resistance of the NTC element. For more than a year we’ve been oversampling the Arduino’s humble ADC to get >16bit ambient temperature readings from a 20¢ thermistor. That pin-toggling method is simple and delivers solid results, but it requires the main CPU to stay awake long enough to capture multiple readings for the decimation step. (~200 miliseconds @ 250 kHz ADC clock) While that only burns 100 mAs per day with a typical 15 minute sample interval, a read through Thermistors in Single Supply Temperature Sensing Circuits hinted that I could ditch the ADC and read those sensors with a pin-interrupt method that would let me sleep the cpu during the process. An additional benefit is that the sensors would draw no power unless they were actively being read. Given how easy it is drop a trend-line on your data, I’ve never understood why engineers dislike non-linear sensors so much. If you leave out the linearizing resistor you end up with this simple relationship. The resolution of time based methods depends on the speed of the clock, and Timer1 can be set with a prescalar = 1; ticking in step with the 8 mHz oscillator on our Pro Mini based loggers. The input capture unit can save Timer1’s counter value as soon as the voltage on pin D8 passes a high/low threshold. This under appreciated feature of the 328p is faster than typical interrupt handling, and people often use it to measure the time between rising edges of two inputs to determine the pulse width/frequency of incoming signals. You are not limited to one sensor here – you can line them up like ducks on as many driver pins as you have available. As long as they share that common connection you just read each one sequentially with the other pins in input mode. Since they are all being compared to the same reference, you’ll see better cohort consistency than you would by using multiple series resistors. Using 328p timers is described in detail at Nick Gammons Timers & Counters page, and I realized that I could tweak the method from ‘Timing an interval using the input capture unit’ (Reply #12) so that it recorded only the initial rise of an RC circuit. This is essentially the same idea as his capacitance measuring method except that I’m using D8’s external pin change threshold rather than a level set through the comparator. That should be somewhere around 60% of the rail, but the actual level doesn’t matter so long as it’s consistent between the two consecutive reference & sensor readings. It’s also worth noting here that the method doesn’t require an ICU peripheral – any pin that supports a rising/ falling interrupt can be used. (see addendum for details) It’s just that the ICU makes the method more precise which is important with small capacitor values. sleep_disable(); // redundant here but belt&suspenders right? The integrating capacitor does a fantastic job of smoothing the readings and getting the resistance directly eliminates 1/2 of the calculations you’d normally do. To figure out your thermistor constants, you need to know the resistance at three different temperatures. These should be evenly spaced and at least 10 degrees apart with the idea that your calibration covers the range you expect to use the sensor for. I usually put loggers in the refrigerator & freezer to get points with enough separation from normal room temp. – with the thermistor taped to the surface of a si7051. Then plug those values into the thermistor calculator provided by Stanford Research Systems. °Celcius vs time [1 minute interval] si7051 reference [±0.01°C resolution] vs. Pin-toggle Oversampled 5k NTC vs. ICUtiming 10k NTC. I’ve artificially separated these curves for visual comparison, and the 5K was not in direct contact with the si7051 reference, while the 10k NTC was taped to the surface of chip – so some of the 5ks offset is an artifact. The Timer1 ratios delver better resolution than 16-bit (equivalent) oversampling in 1/10 the time. 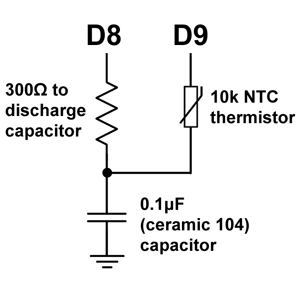 si7051 reference temp (C) vs 10k NTC temp with with a ceramic 106 capacitor. If your Ulong calculations overflow at low temperatures like the graph above, switch to doing the division before the multiplication. Also keep in mind that the Arduino will default to 16bit calculations unless you set/cast everything to unsigned long. Or you could make you life easy and save the elapsedTimeReff & elapsedTimeSensor values to your data file and do the calculations later in Excel. 1) Because my Timer1 numbers were small with a 104 cap I did the multiplication before the division. But keep in mind that this method can easily generate values that over-run your variables during calculation. Ulong MAX is 4,294,967,295 so the elapsedTimeSensor reading must be below 429,496 or the multiplication overflows with a 10,000 ohm reference. Dividing that by our 8mHz clock gives about 50 milliseconds. The pin interrupt threshold is reached after about one rise-time constant so you can use an RC rise time calculator to figure out your capacitors upper size limit. But keep in mind that’s one RC at the maximum resistance you expect from your NTC – that’s the resistance at the coldest temperature you expect to measure as opposed to its nominal rating. (But it’s kind of a chicken&egg thing with an unknown thermistor right? See if you can find a manufacturers table of values on the web, or simply try a 0.1uF and see if it works). Once you have some constants in hand Ametherm’s Steinhart & Hart page lets you check the actual temperature at which your particular therm will reach a given resistance. Variable over-runs are easy to spot because the problems appear & then disappear whenever some temperature threshold is crossed. I tried to get around this on a few large-capacitor test runs by casting everything to float variables, but that lead to other calculation errors. 2) This method works with any kind of resistive sensor, but if you have one that goes below ~200 ohms (like a photoresistor in full sunlight) then the capacitor charging could draw more power than you can safely supply from the D9 pin. In those cases add a ~300Ω resistor in series with your sensor to limit the current, and subtract that value from the output of the final calculation. At higher currents you’ll also have voltage drop accross the mosfets controlling the I/O pins (~40Ω on a 3.3v Pro Mini), so make sure the calibration includes the ends of your range. There are a host of things that might affect the readings because every component has a temperature, aging, and other coefficients, but for the accuracy level I’m after many of those factors are handled by the ratio-metric nature of the method. It’s almost independent of value of the capacitor, so you can get away with a cheap ceramic even though it’s value changes dramatically with temperature and age. (I’d still use at least an X7R or, a plastic film cap for measuring colder temps) Last year I found that the main system clock was variable to the tune of about 0.05% over a 40°C range, but that shouldn’t matter if the reference and the sensor readings are taken close to each other. Ditto for variations in your supply. None of it matters unless it affects the system ‘between’ the two measurements. The significant digits from your final calculation depend on the RC rise time, so switching to 100k thermistors increases the precision. Processors with higher clock speeds should also boost your resolution. You can shut down more peripherals with the PRR to use less power during the readings as long as you leave Timer1 running. 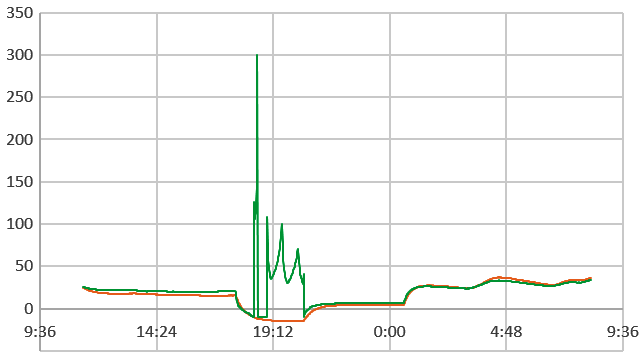 I’ve also found that cycling the capacitor through an initial charge/discharge cycle (via the 300Ω on D8) after long sleep intervals improved the consistency of the readings. That capacitor shakedown might be an artifact of the ceramics I was using but reading your reference twice at the start of each run might be a good way of eliminating errors that arise from the pre-existing conditions, though you’d also be heating up that resistor so it’s a bit of a trade-off. Will this method replace our pin-toggled oversampling? Perhaps not for something as simple as a thermistor since that method has already proven itself in the real world, and I don’t really have anything better to do with A6 & A7. And oversampling still has the advantage of being simultaneously available on all the analog inputs, while the ICU is a more limited resource. Given the high resolution that’s potentially available with the Timer1/ICU combination, I might save this method for sensors with less dynamic range. I already have some ideas there and, of course, lots more testing to do before I figure out if there are other problems related to this new method. I still haven’t determined what the long-term precision is with our Pro Mini clones, and the WDT experiment taught me to be cautious about counting those chickens. °Celcius vs time: (Post-calibration, 0.1uF X7R ceramic cap) si7051 reference [±0.01°C] vs. thermistor ICU ratio w 10k reference resistor charging the capacitor vs. the same thermistor reading calibrated using the rise time through pin D8’s internal pull-up resistor. The reported ‘resistance’ value of the NTC themistor was more than 1k different between the two methods, with the 10k met-film reference providing values closer to the rated spec. However the Steinhart-Hart equation constants from the calibration were also quite different, so the net result was indistinguishable between the two references in the room-temperatures range. The internal pull-up probably isn’t a real resistor. More likely its a very thin semiconductor channel that simply acts like one, and I found the base-line temperature variance to be about 200 ohms over my 40°C calibration range. 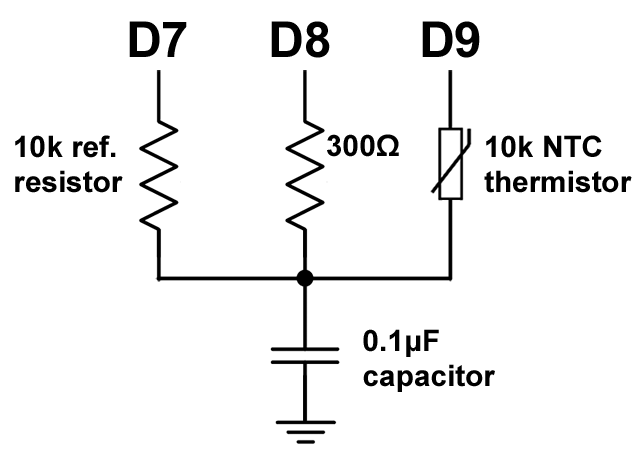 And because you are charging the capacitor through the reference and through the thermistor, the heat that generates necessarily changes the changes those values during the process. However when you run a calibration, those factors get absorbed into the S&H coefficients provided you let the system equilibrate during the run. As might be expected, all chip operation time affects the resistance of the internal pull-up, so the execution pattern of the code used for your calibration must exactly match your deployment code or the calibration constants will give you an offset error proportional to the variance of the internal pull-up caused by the processors run-time. Discharging the capacitor through D8, also generates some internal heating so those (~30-60ms) sleep intervals also have to be consistent. In data logging applications you can read that reference immediately after a long cool-down period of processor sleep and use the PRR to reduce self-heating while the sample is taken. Code consistency is always important with time based calibrations no matter how stable your reference is. Another issue was lag because that pull-up is embedded with the rest of the chip in a lump of epoxy. This was a pretty small, with a maximum effect less than ±0.02°C/minute and I didn’t see that until temperatures fell below -5 Celsius. Still, for situations where temperature is changing quickly I’d stick with the external reference, and physically attach it to the thermistor so they stay in sync. Addendum: What if your processor doesn’t have an Input Capture Unit? With a 10k / 0.1uF combination, I was seeing Timer1 counts of about 5600 which is pretty close to one 63.2% R * C time constant for the pair. That combination limits you to 4 significant figures and takes about 2x 0.7msec per reading on average. Bumping the integrating capacitor up to 1uF (ceramic 105) multiplies your time by a factor of 10 – for another significant figure and an average of ~15msec per paired set readings. Alternatively, a 1uF or greater capacitor allows you to record the rise times with micros() (which counts 8x slower than timer1) and still get acceptable results. (even with the extra interrupts that leaving Timer0 running causes…) So the rise-time method could be implemented on processors that lack an input capture unit – provided that they have Schmitt triggers on the digital inputs like the AVR. Then repeat the pattern shown earlier for the thermistor reading & calculation. I’d probably bump it up to a ceramic 106 for the micros method just for some extra wiggle room. The method doesn’t really care what value of capacitor you use, but you have to leave more time for the discharge step as the size of your capacitor increases. This entry was posted in * Developing NEW sensors *, Developing a TEMP ℃ chain and tagged 328p, arduino, high resolution, sensor, tutorial on March 25, 2019 by edmallon.